Taverner's writing alternates tutti sections with smaller groups and this gave scope for some lovely individual interactions between players. There was a real sense of this being a conversation between friends, with a lovely interweaving of musical line, and harmony. Whilst much of the performance achieved a lovely meditative calm, the Agnus Dei really built to a lovely sense of climax. The two works by Sir John Tavener were originally written for the counter-tenor Michael Chance. Nipson for countertenor and viol consort was written for Chance and Fretwork in 1998 and sets a Greek palindrome which translates as Wash the sins, not only the face though there was other text too (at least a Kyrie eleison in one section) but this was not printed in the programme. Here Fretwork was joined by counter-tenor Iestyn Davies for a work which seemed to relish the contrast between the highly lyrical, melismatic vocal line and the strongly textured sustained chords of the viols. Another interest of Tavener's in the piece were sections where viols paralleled the voice, and this brought great admiration for the technical skill and perspicacity of the players. The Hidden Face was another work written for Michael Chance, but originally for counter-tenor, oboe and strings but here given in Fretwork's version for viols. Fretwork and Iestyn Davies were joined by oboist Nicholas Daniel, with the two soloists playing from the balcony and the deep gloom of the lighting making them almost invisible. The work sets a prayer and Tavener describes it as a prayer and to be deliberately with 'nothing personal or idiosyncratic'. The viols played what seemed like a constantly repeating sustained figure full of Tavener's parallel harmonies, and over this the two soloists exchanged melismatic phrases, developing into something truly rapturous. For both Tavener pieces, I was supremely impressed with the poise and technical skill of the performances. Tavener's music leaves the performer no room for manoeuvre, every not needs to be in place. But both pieces seemed to be aiming for a kind of incantatory transcendence which simply did not move me. This was music whose skill I could admire, but which left my emotions cool though I was in a minority and the audience responded rapturously to both performances. 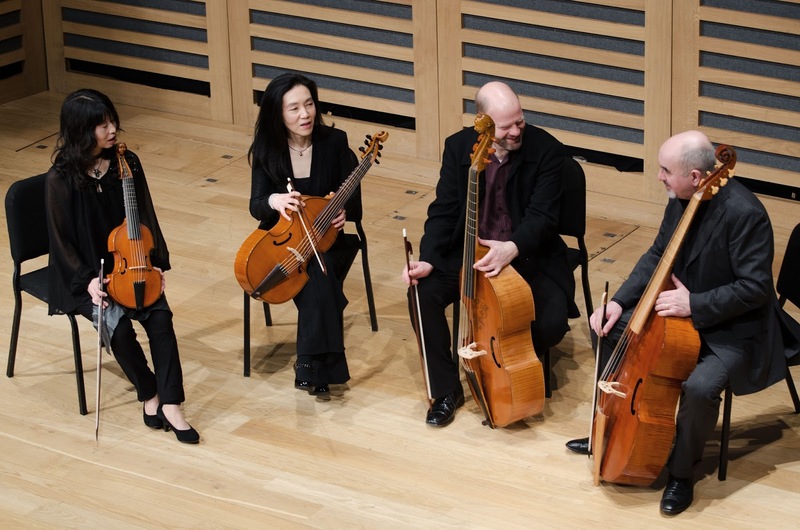 This was a fascinating and intriguing programme which showed the range of the viol in both Renaissance and contemporary music and in the performance of John Taverner's Missa gloria tibi trinitas let us experience something which our forbears would have taken for granted.